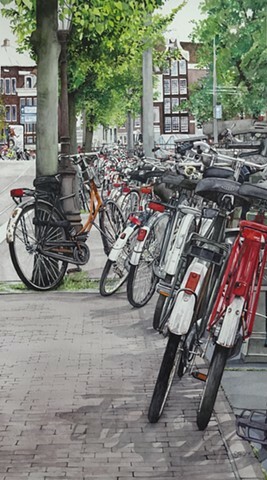 Conny Jager, Artist - Now Where Did I Park? Now Where Did I Park? Currently, in Calgary, our city council has voted to enhance our bike route systems in the downtown core. It's been a very controversial topic, and I can't help but think about the bike system in Holland and how amazing it is. Climate-wise, Calgary is not like Holland, and never will be, but it did get me to dig through my inspiration images and find this one to paint.